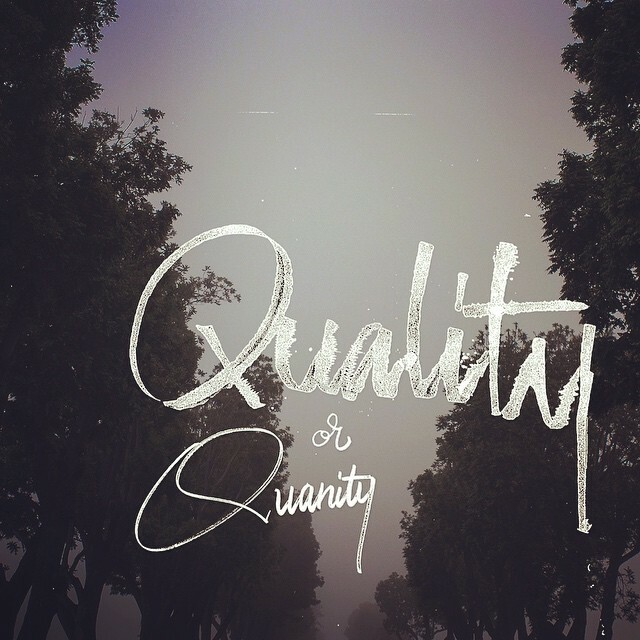 Being a creative individual you may have heard the saying focus on the quality not the quantity. Well focusing on the quantity it only allows you to go so far. Because when you are putting out more quantity you will eventually develop better quality. Think of a person you know who when they first started their work was terrible. Now after them working hard and constantly putting out work they have improved. A good example is to look deep into my feed on instagram when I started taking calligraphy seriously. You can see the progression from terrible to ok and now from ok to mediocre. I for one do not like to feel as if I have ever reached my plateu I want to continually keep improving. The same thing should be for you. You have to want to improve more than anything. If you are not wanting to improve your work will continue to be the same. As well as your life will continue to be the same. Now If you are an individual who wants to improve then you have to put your head down and get to work. By get to work you have to get creating. Many people fall into the trap of “hows it going to make me money?” This is a repeated phrase from people focusing on the wrong thing. I am not saying money is a bad thing. Just that with more experience you can increase price and quality. Do you think many companies who put out products who are terrible that if they did not put the products that were crap they would not have improved the quality. But you have to be willing to experiment and fail. This is a process that is continuous throughout your whole life. Not giving up when you feel its not worth it anymore takes will and believing in yourself and your work. Putting out a lot of work will allow you to improve the quality of your work. So you have to put your head down and get to work creating. If you are just sitting around waiting for inspiration it will not come to you. When you are working consistently and frequently you will put out a great quantity of work and therefore your skills will improve. But you should continually focus on improving your work when you are creating.